Today, quick reviews of two new (and sweet) flankers: Prada Candy L'Eau and Dolce & Gabbana The One Desire. Candy L’Eau is the latest from Prada, and it's meant to be a lighter version of 2011′s Prada Candy. And yes, that's just what it is — the start is fresher, cleaner and paler, with plenty of bright citrus replacing the deeper fruit notes of Candy, and as it ages on skin, a lighter dose of Candy's root beer-ish benzoin. There's also less caramel sugar, less dark woods, and, well, less of everything: if you really wanted a summer version of Candy, or if the original Candy was just too much candy for your tastes, Candy L'Eau might well suit you just fine. I'm a fan of the original and hadn't thought to want a summer version; Candy L'Eau didn't do anything to spark my desire. The white musk in the base is a shade too functional for my tastes — now and then, there are vague echoes of dryer sheet — and while the overall smell is reasonably close to the original, it seemed sort of like they'd taken most of the fun out of it. It's not bad, but I'll pass. Candy L’Eau was developed by perfumer Daniela Andrier, who also did the 2011 Candy fragrance. The notes include citrus, floral notes, white musk, benzoin and caramel. It is available in 50 and 80 ml Eau de Toilette. I have smelled the original Dolce & Gabbana 2006 scent The One, but I didn't care for it and I've mostly forgotten it, so I can't answer the most obvious question — how does the new Desire flanker compare. The only reason I chased after the flanker is because it's come up here several times in the comments as being similar to, or maybe even better than, the original Prada Candy. With apologies to its fans, I'm sorry to say that I am not among you. It is a gourmand, and in many ways it follows the same fruit-flowers-candy progression as Candy, without the heavy benzoin but with a Candy-like thread of caramel running through the later stages. The One Desire places more weight on the florals in the heart, but my objection is all about the fruit, which is particularly strident in the opening — I'm not sure what fruits are present, and the lychee listed in the notes couldn't possibly be enough to account for my reaction, but I did not find it enjoyable to wear, and as with everything that one doesn't find enjoyable to wear, it has the half life of plutonium. Another pass. The One Desire features notes of bergamot, mandarin, lychee, lily of the valley, tuberose, caramel-infused vanilla, sandalwood and musk. It is available in 30, 50 and 75 ml Eau de Parfum. As always, if you've tried anything fabulous lately, do comment! But I do know that many people found Candy unforgivably sweet — do think this lighter version will find an audience. I had the same problem with Candy that I have with most Prada fragrances — too light! I don’t know if I’m anosmic to something in them or they’re just all too subtle for me or what. They always strike me as Instant Drydown. I’d want a stronger version of Candy, not a lighter one. The One Desire, on the other hand, is definitely too sweet. I’m with you there Robin. Gosh, will be interested to hear other viewpoints, but Candy is not all that light to my nose — I’m thinking yes, anosmic to one of the musks & it’s blocking much of the rest. That must be it. At least I can smell NR for Her! Well, this solves the mystery of why all the Prada fragrances I’ve tried smell so weak, although I can’t smell anything past the opening of NR for Her edt either. As a variation on this theme, Candy is the only Prada I can actually smell. The first time I sampled Infusion d’Iris, I truly thought there was something wrong with the bottle I was sniffing from. I couldn’t smell a thing! I’m the same. Candy is the only Prada I can smell and I really like it. The others all smell of ironing water. Ok, I smell a bit of the original but that’s it. How interesting! What I don’t know about anosmia is a lot. I have been reading reviews on this website for a while now and I am tired of the so called ‘reviews’ that say nothing about the fragrance but keep looking down at it. And then follow a bunch of tasteless jokes, rolling eyes etc. Is this website all about this? Really, I said nothing about the 2 fragrances? I’d have to disagree with that, but it is true that I did not love either of them, and apparently some of the commenters didn’t either. If you don’t like to see negative reviews, and I know some people don’t, in fact this might not be the perfume site for you. There are lots of blogs that never do negative reviews so hope you can find one you like better. Hi Ralovesuk, I understand that negative reviews might not be of everyone’s taste… But I disagree with you on the “not a review” point. One of the reasons I’ve been faithfully reading this blog since years now is because when Robin reviews a perfume, one can really “smell” what she is saying. No waxy prose, no self promotion, no embarassing confessions, but a clear description of the fragrance. These quick reviews for example smell both of caramel – one caramel is fruitier and more floral than the other. I read many blogs, and enjoy them all, but Robin is (for me) the only writer who is really able to focus on the fragrance and describe it accurately. She is able to put into words those tricky smells that make the perfume- and my nose agrees with hers, though our tastes are completely different – strange isn’t it? All this to say: you are free to disagree, but I don’t you really smell the sweet candy notes of caramel by reading these reviews? Robin has the most objective and informative perfume reviews on the web. God forbid you ever look at my blog. Ari, your blog cracks me up! Love it! My thanks to everyone who is coming to my defense, but let’s let this drop now before anybody gets insulting to anybody else…I really am ok with the idea that what I do here isn’t to everybody’s taste, that’s the way it should be. To ralovesuk: the wonderful thing about the web is, if you don’t enjoy a site, you don’t have to visit it! For me, NST is a daily delight! Just to make sure that I was clear: Sacre blue has it exactly right. “Desire” made me desire a shower – D&G scents are pleasant, as a rule, but this one was Not Me. I haven’t tried “Candy Lite” yet but I might – the original was interesting, but too heavy for my taste. I do love our dialogues here on NST; even when one or more of us doesn’t like a scent, we’re all free to disagree. It would be a boring world if we all liked the same fragrance, or the same notes. Perfume, like any art, is open to criticism – and subjectivity is a factor as well! Some commenters really loved it…hope some of them will show up again today to comment, and obviously it’s worth a shot since there is disagreement. But Angie hated it so much she declined to review it at all. I would not be comfortable with any website that never said anything negative about any fragrance, but I do totally understand that some people prefer to read more positive than negative, or even all positive. That’s ok with me — there’s a place for everybody. Wow, that is an impressive reaction. What was it that was so awful? I don’t think I’ve heard an outright hate since er…Eau Emotionelle? or wasn’t there a Lutens that Kevin thought smelled like someone’s cat had peed in the potpurri? She said something about a spike to the head, and I assume she meant something about the fruit notes in the opening — “strident” was actually a nice way of putting it. Ooh, the railroad spike, aka instant migraine. Yes, I’ve also tried that fragrance family. The posts on those sites that never give negative reviews often seem like long adverts to me. It’s not an entirely fair reaction since they are totally open about whether the sample was given to them, or bought themselves, and since they are not ‘in the pay’ of the relevant brands. They just don’t review perfumes they don’t like. I guess I know that logically, but to me it comes across as unbalanced reporting: like a movie reviewer who only writes about movies he likes. Also, I think its fair that if one reacts negatively to a perfume there are reviews that can help one understand that reaction better and perhaps provide the terms to explain it? They seem like adverts to me too, and I agree it’s not a fair reaction but I can’t help it…and that despite the fact that many of them don’t take advertising and I do. Hey, to each his own, right? Everybody should blog the way they want to. This is pretty much how I feel too. And I think if you’re going to try to cover the industry in a way that even approaches comprehensive (as much as that’s even humanly possible), it’s not realistic to expect that it’s all going to be positive. Hell, I read The Guide partially *for* the snarky negative reviews. I definitely found they enlivened it and made it more engaging… Still, I don’t think its fun to be the subject of a negative review – but I guess one has to get a thicker hide in many industries to survive. I tried the original Candy and liked it okay—although not enough to actually buy it—but then tried the lotion and found I liked it better than the perfume. It’s fairly light and not at all overpowering, and it layers well under several different woody or sweetish scents (including Infusion d’Iris Absolue). If they do a lotion for this new one I’ll look for it. Good to know, thanks! I can see that being really nice with IdI Absolue. I like gourmands but for some or other reason just found Candy to be dull. I only had a quick spritz of L’Eau and at first it really reminded me of infusion d’Iris, ( Candy original did not remind me of IdI – though I have heard other people find them related).L’Eau came across as light and airy and moving; less static than Candy, but I think it may have lost this spark somewhere on the way, so I need to re-try! Eh, there’s enough elsewhere, right? I admit I don’t re-try things as much as I used to. Prada Candy was too sweet for me..I don’t do caramel..even a lighter version I probably wouldn’t like. I am done with candy already! I want the 90’s back. I didn’t like Candy ,the original – probably one of a very few people ! it seems v popular. Desire- I actually enjoyed and wanted to buy a small bottle but I keep thinking of all the really *good* scents I could be putting that money towards …..so I haven’t . Finally, a fan! Thanks for chiming in. That one will almost certainly end up at discount, so maybe you’ll come across a reasonably priced bottle some day. I recently tested Desire and didn’t like it at all either. For me, D&G only ever made one great scent, the original Pour Femme and, on the right day, By. Nothing since has spoken to me. I love Candy- it is the only Prada, bar the original, that I can smell. Can’t imagine I would want one with all of the fun bits taken out! Thanks for your reviews, Robin- NST was my first perfume blog to love and I wouldn’t change it. I missed Pour Femme in its first incarnation, and am not going to try the new version. Unfortunately, some people get personally insulted if someone doesn’t like what they like. People with low self-confidence. Robin and I seem to have very different tastes in perfume, yet I remain a dedicated reader. I find her descriptions so clear, it really helps me pinpoint which scents I want to try (often perfumes she doesn’t care for – ha!). As it turns out I prefer The One Desire to Prada Candy. The opening of Candy is great, but (on me at least) it dries down to something screechy. The One Desire stays warm and sweet throughout. Not something I’d wear every day, but I have a little sample I’m hanging on to. BTW, when people say they can’t smell Pradas, surely they don’t mean the original? I have it and love it, but find it’s SO big that it wears me rather than the other way around. Glad to see another fan of The One Desire chime in, thanks! And reading back through this, I’d say there are definitely people here who can’t smell Prada the original — if I ever knew that, I’d forgotten. I know there are many who can’t smell Infusion d’Iris. 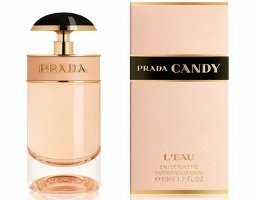 I love the original Prada Candy and used it A LOT from October 2011 to perhaps February 2012….I went through 50 mLs of the 80 mL bottle in that time. I have a bottle of the L’Eau which I bought (gasp!) unsniffed. It is still in its shrink wrap but I will open it soon due to this really hot weather we are experiencing in the Northeast. As to The One Desire, I liked it on paper blotter but have not worn it. I do have several freebie samples and will wear it on a day when I can quickly scrub it off – I’ve learned my lesson well with Florabotanica. You know, I neglected to even try TOD on paper, I just went right ahead and used up skin space. Maybe tomorrow I’ll see how it is on a blotter. Will be curious to hear what you think of Candy L’Eau. I sniffed L’Eau a few weeks ago and rather liked it – but I’m one who liked the original but found it just too much. I think it’s the Texas heat – L’Eau seems like it would work better for me. I tested this side by side with Bottega Veneta’s new Eau Legere which I also found lighter (with way more musk in the dry down than the original) but overall liked both, esp for the hot summers. This reminded me of a skin scent with a touch of leather. Neither one has inspired me to buy, but I definitely wouldn’t mind a nice sized decant of either one. I liked the BV better, I think, but can totally see Candy being a bit much for a Texas summer. Of the two, I liked BV better as well. I did not care for the original Candy as it seemed too sweet and heavy for me. My tastes have changed since then. But really, I did not test Candy properly. Too often I yanked the sprayer off the bottle, assuming it was the cap, and scurried out of the shop in a lather of embarrassment before I could get a sense of what the perfume smells like. So I will take a deep breath, slow down and give L’Eau a go. LOL…the bottle is designed to be broken! Anyway, I came home and ordered some samples of Candy so I can test my friendship with her for a while. But If she turns up her music too loud or leaves wet towels in her bedroom, we are through! I like the original Prada Candy enough to buy it. I wear it frequently in the colder months. When I sampled L’Eau, I just sniffed on a test paper and my reaction was, “This is a jumble!” I didn’t get anything that reminded me of what I love about the original. Your review makes me think that I should go back and sample on my skin. I still want to pull out the original, despite the sunny weather! Perhaps I will find the L’Eau a more appropriate version for this time of year. Plus, I adore the Candy bottles and think the L’Eau bottle would make a delightful addition to my shelf. With regards to D & G’s The One Desire. I did sample this on my skin, and I liked it initially. The more it wore, the more it reminded me of other things I already own (I believe Juicy Couture’s Viva La Juicy was the strongest association I had). I think the Desire bottle looks more appropriate for a Fall/Winter/Holiday release, rather than spring, not that it matters all that much. I do adore Rose The One, which is the only rose-themed perfume I can wear without getting a headache. Yes, I can see the VLJ connection — I think I like VLJ better too. Prada Candy was fun, if a little pedestrian when compared to the haughty elegance of Infusion D’Iris. I did not like it well enough to buy, but I did like the daring flacon. The light version is lobotomized, with no personality, it does neither offend not delight. Perhaps I’m a lone voice here, but I see no point in certain fragrances having “light” or “summer” versions. Take Angel for example. It’s heavy, it’s designed to be heavy, and it’s still heavy if washed-out in a summer version. What’s the point? Same for Candy, it’s loud, sweet and to me, vulgar. It would look right at home on Belle Watling’s dresser. You can not make a ladylike version of it same as you can’t make a lady out of Belle Watling, even though she had a heart of gold. Desire was both vile and forgettable, can’t think of one more thing i could remember or be bothered to say about it. Hmmm…there certainly aren’t all that many really great summer flankers of regular scents, but there must be *one* I like better. L’Eau de Chloe, maybe, but it was hardly related to the original. Have to keep thinking. I tried the original Candy and liked it. I actually bought a small bottle. Somehow now I don’t like it anymore at all. It isn’t sweet to me and there’s no caramel. The first few times I tried it it was wonderful and now it’s just a chemical smelling mess. Thankfully I can’t call it a scrubber because it now disappears in about 30 minutes. I won’t even bother trying this new one and my bottle will most likely end up being rehomed in a swap. I don’t know why my nose changed so much on this one but it did. I am a huge fan of the original Candy too! But the metallic dry-down on my skin is slightly annoying. I was wondering if the metallic aspect is gone in this flanker? Candy L’eau is still unavailable here in Spain (how long does it take honestly!?) so I have yet to try it myself. I got back from trying Candy L’Eau on my skin. Very nice and mellow. Not metallic-y. Thanks Now all I have to do is cross my fingers and hope it arrives soon! Agree, not metallic to me. It was interesting to read the comments from those who find the original Candy too light or ‘not there’ (unfortunately, I haven’t had the chance to try the L’Eau yet). I think my problem with Candy (and NR for Her AND Id’I, as a matter of fact) is also the musk, but it’s the opposite problem. I enjoy the very initial smell of all three and then the musk takes over and they all smell very strong to me with a musk that goes on and ON. I can’t wear any of them! I guess I have the opposite problem to anosmia when it comes to musk, or at least certain musks. Thanks for the reviews! LOL at Desire made me desire a shower!! That was supposed to be posted after maggiecat’s comment. No coffee yet today! The first time I sprayed Candy on my wrist, I was like “No way! You charge almost $100 for a cheap vanilla oil? !” So I left that counter at Nordstrom, ignoring the sales lady’s comments “you’ll see honey…I don’t know what they put it in it; might be the benzoin, but all men go crazy about it.” Oh boy, was she right! Half an hour later, my boyfriend who was picking me up at the malls said ” I seriously want to eat you. What is this you are wearing?” And wouldn’t stop sniffing me like a German Sheppard at the International terminal. Stopped for a quick shopping at Abercrombie&Fitch and one of the floor guys (way younger) approached me and said “I’ve been following since you walked in. What is your perfume?” Hm… the sales lady was right. I got the Candy after I sent Santa a letter last Christmas and it is truly one of my most favorite fragrances! Love it. I only like the new version, Candy L’Eau when I have not smelled the original before. Nothing can come between and my Candy!